Nike’s Air Max 97 has returned with a new colorway offering. 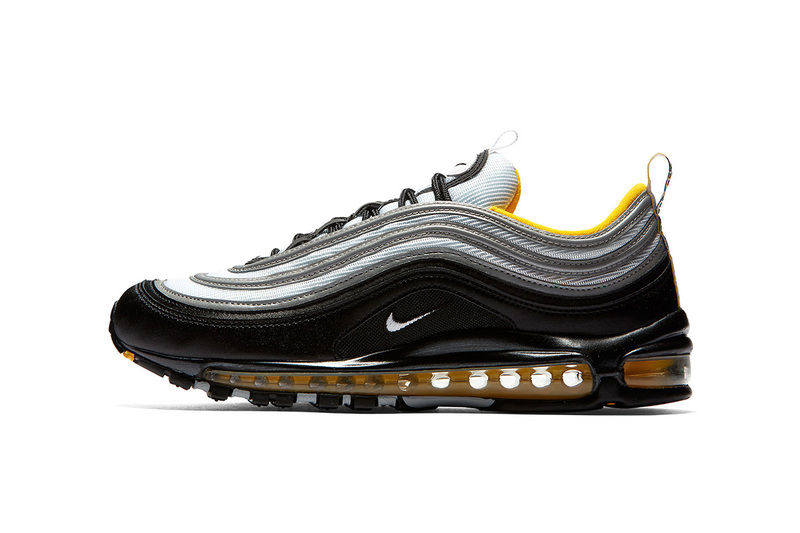 One of the most popular Air Max models sees a mix of black and silver throughout with subtle yellow accents found on its inner lining and full-length Air Max unit. The bottom half of the upper is designed with black as the top alternates grey and reflective silver throughout its piping. Branding finishes things off on the tongues, heels and each lateral and medial side. There’s no confirmed date for this Air Max 97 iteration – the kicks retail for $160 USD. Stay tuned for additional information and let us know if you plan on adding them to your personal collection. In related news, here’s an early look at the next Nike Air Max 97 x Off-White™. Nike Dresses the Air Max Plus 97 in "Triple Black"
Spotlighting public artworks of the artist’s signature abstract forms. Stripes, houndstooth and mismatched insoles. With untouched tassels at the hem.